In several societies of emerging economies, an increasingly large community collects and buys bouquets for celebration purposes linked to the scalability and adjustment of components. Many schools use floral design customization to improve aspects of sociability in schools with problems of structured violence. So, second-hand cargoes of separate parts can build bouquets at a low cost. An order-picking algorithm can be used as the primary guideline because providers often implement a route system depending on the needs for the assembly of the floral design considering the different components that are required and using a model associated with the relevance of a match according to the customization of the new bouquets. In many cases, it has been challenging to develop an adequate transfer of the components; thus, the same routes have been used for a long time, and new provisions on traffic behavior and new routes are not considered. In this research is proposed a new algorithm based on the behavior of birds, called PSO to improve and solve the problem of this order picking model. 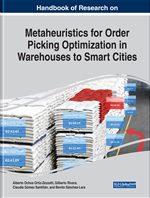 The main problem is stated by inadequate location of order picking algorithm demands or management. This ill management of resources is translated in high costs of maintenance of order picking algorithm, as is possible see in Figure 1. Another situation is the prolonged time workers in a bouquet factory spend in the order picking algorithm while being taken to require components or back to another assembly section of a complete floral design, already with the components in their integrating part; the region of study is shown in Figure 1 based on a specialized research presented by Ho and Lin (2017), where they stated a variation of a Vehicle Routing Problem (VRP) called Order Picking Algorithm (OPA). In it is stated that the problem can be divided in five subproblems. Data Preparation: It defines the data required to set up the stop allocation, the route definition and the scheduling. Stop Selection: Consists in allocating all the workers in a bouquet factory in different areas to the nearest assembly section. Route Generation: It covers the decision of an order in which the order picking algorithm will visit each step. Arrival Time: It covers the setting of time for which the workers in a bouquet factory must arrive in a section with more components to organize. Schedule of Route: Deals with allocation of order picking algorithm routes that best fit, taking under consideration the time for which workers in a bouquet factory must arrive at next section of assembly, while establishing plans to allow each order picking algorithm transport workers in a bouquet factory from any stock of components to their particular section of assembly. Most laborious job in a typical warehouse. Up to 55% of warehouse operating cost. Direct influence on order accuracy and delivery time. Order Picking Algorithm Capacity: The maximum number of workers a bouquet factory may contain. Maximum Travel Time: The maximum time workers in a bouquet factory can stay in the truck. Time Window: The time it takes to arrive. Homogenous Capacity: Exist order picking algorithm with different capacity. Mixed Load: Different workers in a bouquet factory from different section of assembly. We are considering a novel order picking algorithm based on the study of Scholz and Wäscher (2017) determining that different eight components have different color, tonality, additional components, variations in design, section to assemble with other components, shape and thickness for the adjustment of section as it occurs with the piece called “soul” that connects and assembles the rest, as can be seen in Figure 2(a) and Figure 2(b).